Although nuclear weapons were last used almost 70 years ago, the sound of the nuclear doomsday clock can still be heard. Its persistent ticking echoes in the halls of the United Nations (UN), it accompanies talks at high-level meetings on global peace and security, and it is heard by millions of people around the world who keep working towards the elimination of nuclear weapons. It feels like a lifetime has passed since the world witnessed the devastation that a nuclear weapon detonation can cause. While there are countries that believe the world will never see such an event again, others fear that the continued existence of nuclear weapons means there is always that possibility. Despite agreement by all states that a nuclear weapon detonation anywhere in the world would cause tremendous destruction to humans, animals and the environment, lack of progress towards complete nuclear disarmament is moving the doomsday clock ever closer to midnight. Although the global arsenal of nuclear weapons has decreased from approximately 70 000 in 1986 to roughly 17 000 today, many countries argue that nuclear disarmament is progressing too slowly. 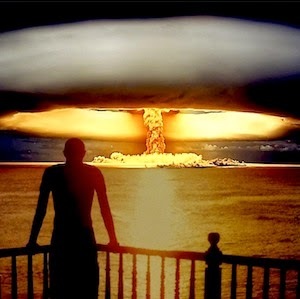 Countries that possess nuclear weapons include the five nuclear-weapon states recognised under the Nuclear Non-Proliferation Treaty (NPT) – the United States (US), Russia, China, France and the United Kingdom, as well as three nuclear armed states – India, Pakistan and North Korea, and one other state believed to have nuclear weapons – Israel. In addition, there are approximately 30 states protected by the ‘nuclear umbrella’, having either entered into bilateral defence agreements with the US or as members of a nuclear-armed alliance such as the North Atlantic Treaty Organisation (NATO). There has been a lack of progress in various multilateral nuclear disarmament and non-proliferation forums, including the NPT, the UN Disarmament Commission, and the Conference on Disarmament (which has not been able to agree on a programme of work in 18 years). This has led a number of states and civil society organisations, especially from nuclear-weapon-free zones in Africa, Latin America and the Caribbean, the South Pacific, Central Asia and South East Asia, to consider how to constructively reinvigorate the nuclear disarmament debate. These states and civic groupings aim to refocus the world’s attention on the humanitarian impact of nuclear weapons, and to ensure that the responsibility for disarmament rests with all states, not just those that possess nuclear weapons. A number of activities have taken place since 2010 to draw attention to the humanitarian impact of nuclear weapons and to reframe the nuclear weapons discourse. The humanitarian impact of such weapons was referred to in most, if not all, international non-proliferation meetings since 2010. Notably, two intergovernmental conferences on the humanitarian consequences of nuclear weapons have taken place: in Norway in March 2013 and Mexico in February 2014, with a third conference to be held in Vienna in December 2014. These conferences allowed a range of actors from government, civil society and academia to help shape an expanded discourse about the effects of a nuclear weapon detonation through fact-based and comprehensive discussions. As a means to show its support for a world free of nuclear weapons, the UN General Assembly in October 2013 declared 26 September as the International Day for the Total Elimination of Nuclear Weapons. Established through UN resolution A/RES/ 68/32, the day aims to enhance ‘public awareness and education about the threat posed to humanity by nuclear weapons and the necessity for their total elimination, in order to mobilise international efforts towards achieving the common goal of a nuclear-weapon-free world’. The resolution also calls for the urgent start of multilateral negotiations on a nuclear weapons convention – a global treaty to prohibit and eliminate nuclear weapons – and specifies that a high-level UN conference be held no later than 2018 to review and enhance progress on nuclear disarmament. International Day for the Total Elimination of Nuclear Weapons will be commemorated in various of ways, including an event hosted by UNFOLD ZERO and the UN Office of Disarmament Affairs. The event is to be co-sponsored by the permanent missions of Indonesia, Kazakhstan and New Zealand, the Agency for the Prohibition of Nuclear Weapons in Latin America and the Caribbean (OPANAL) and more than 60 civil society organisations, including the Institute for Security Studies. It will highlight the growing momentum of a humanitarian approach to the elimination of nuclear weapons. An important feature of this approach has been the inclusion of stakeholders from diverse backgrounds, with different views on how the prohibition and elimination of nuclear weapons should be pursued. However, it has also opened the movement up to criticism, especially from states with nuclear weapons. These critics have deemed a humanitarian approach distracting and naïve given that it has diverted attention from the traditional step-by-step approach to disarmament. Supporters of the movement argue that the approach brings the disarmament debate to a level where all interested stakeholders can provide input. Given that the continued existence of nuclear weapons affects everyone, it makes sense that we should all have the opportunity to determine the process of prohibiting and eliminating these weapons. As the largest nuclear-weapon-free zone in the world, the African continent has, and must continue to play a significant role in moving the agenda on the humanitarian impact of nuclear weapons forward. Africa has always been leagues ahead in its understanding that nuclear weapons have no role to play in ensuring national, regional and global security. At the Positive Action Conference for Peace And Security in Africa in Accra, Ghana in 1960, Kwame Nkrumah said, ‘We in Africa wish to live and develop. We are not freeing ourselves from centuries of imperialism and colonialism only to be maimed and destroyed by nuclear weapons. We do not threaten anyone and we renounce the foul weapons that threaten the very existence of life on this planet’.